2.7v: using this supercap + this module, just hook up any 6v solar panel to Vin and the supercap on the Vout with a diode in between that will block any reverse current and most important will drop voltage by ~0.7v to make it suitable for the supercap. FWIW, I've noticed quite a variance in the peak voltage produced by various 6v solar panels, even within the same model! I've had some that go as high as 7.5v in direct sunlight. Others never make it above 5.5v even in direct sunlight. Go figure. It's best to think of 6v as a purely nominal value. At least from what I've ready, I'm pretty sure you'll find the self discharge rate on that supercap to be very high. In fact I'll do some more tests in the next days to see how much energy it can get vertically on the side of the wall, but I think I'll be heading on the 2.7v option. Maybe the crappy quality 100F Chinese supercap has an higher discharge rate, but after 3 days it is still at 1V and it has been sending 4 values every 10 minutes, so in my opinion it is a very reasonable result. In addition I'm not very convinced about the 5.5v supercaps since they are just 2 2.7v caps glued together, without any balancing, so for something that doesn't discharge to zero on a regular basis it will inevitably kill one of the 2 caps. Not to mention how much easier it is to handle a single big cap instead of soldering a bunch on some sort of pcb. My biggest problem now it is more related in understanding why the voltage value I get from the A0 through the voltage divider is off +/- 0.3~0.5v. I checked with the multimeter and with a voltage divider calculator and I do get values within a very small error (resistors tolerances). For example on the 2.7v caps I'm reading 1V on multimeter and arduino reports 0.7v, while on the 5.5v caps I'm getting almost 0.5v more. I'm not sure what to look for. The code was from an example of @sundberg84 . Since on the 2.7v I'm running it on a steady 3.3v source (booster), maybe I could read the voltage directly from the A0 pin without voltage divider, or is it gonna kill the arduino? IIRC, you shouldn't try to read a voltage that's higher than around 0.3v (or was it 0.6v?) more than VCC. Either way, if VCC is 3.3v, then 5.5 is well outside that range. Since you're assuming access to direct sunlight, you can tolerate a lot of inefficiencies because of the overabundance of available energy compared to what most sensor nodes require. I remember one guy posted who had a similar 6v solar panel outdoors, and IIRC he said his 10F supercap was already fully recharged just from the daylight before sunrise. i.e. it's bright outside. So, even if your cheap 100F supercaps lose most of what they collect through high self discharge, but they collect a much larger amount all day long because of their higher capacity, maybe you come out ahead. Seems like a worthwhile experiment. Glad you're doing it. I wonder what it may be. I would guess the capacitor has a high internal resistance. Your multimeter doesn't see it unless the capacitor is under load. But your arduino is a load, so it sees it. Maybe a schematic of your setup would help the readers of your thread make informed comments. Otherwise, it starts to become 20 questions, if you know what I mean. People on this forum love to look at schematics. Well, if 0.1uf is normally sufficient, why wouldn't it be in your case? There's an easy way to test my hypothesis: why don't you try powering your setup from some fresh batteries (or a high quality supercap if you have one) and see if there's still the voltage discrepancy? If not, then it's the ESR of your cheap supercap. If it's still there, then maybe you just need to calibrate? Uploaded to where? I don't see anything. Nevermind, I see it now at the beginning of the thread. I'm currently testing the single 100F cap but it seems the buck boost is barely able to charge the supercap in direct sunlight, while the solar panel connected directly to the 5.5v supercaps was working much better. I'll have to try with a normal buck converter as it seems now the boost mode is making the solar panel working on a voltage too low that doesn't produce much power. I replaced the buck-boost module with a simple buck converter and it seems to work much better since the operating voltage is from 4.5V to 23V. As you can see from the below picture, the buck-boost barely charged the cap while in direct sunlight while the buck converter was able to charge the cap in a short time even with a cloudy day. I am also very happy since I set the output voltage to 2.62V on the buck converter and I actually get 2.62V reported by the arduino. @gohan I suspect it's "working" because the voltage on your boost converter is higher than 2.62v from the solar panel anyway at the time that it's charging. Even on a cloudy day, it's not hard to get more than 2.6v on a 6v solar panel. 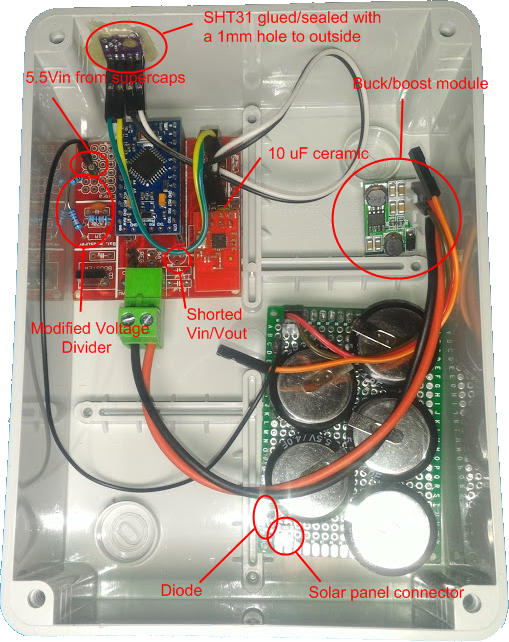 The booster is only from the supercap to the node to keep a steady 3.3v. The solar panel if feeding the buck converter directly so it will start charging when panel is providing around 4,5v. It is a double conversion, I know, but efficiency is not the goal. @gohan It suggests your boost converter is mostly failing to boost whatever is in the cap to the target voltage. Im I wrong if I say that both @gohan and @NeverDie discuss a lot of solar/supercap in multipe threads? Have some of you come to an conclution? Wich supercap is best(good enough)? This is very interesting but im an curious what is the optimal setup? @xydix In what sense do you mean optimal? I think what separates our approaches is that gohan wants to buy readymade parts off aliexpress and, if possible, connect them with dupont wires. So, if that rings true for you, then you will probably find his approach more optimal. @NeverDie Doesn't matter for me. I have seen your boards on openhardware for solar panels. Interesting. In many cases an custom PCB get pretty expensive if you just want 1 or 2 board because buy all components required, these are often is selled in 10 pcs or more. In my case, I want something that works, then if i can get away with just an LDO on an protoboard im fine with that. I try to build as cheap nodes as possible. Then if i can find cheap stuff in aliexpress that is doing the job, thats fine. Have you had any good results useing solar panel indoors? Definitely yes. A typical $1 6v solar panel together with an LDO and diode works fine. At least for me. Gohan is exploring something altogether different, and I'd rather not derail his thread. So, if you want more detail, just read the thread I wrote previously. If you want the barest minimum of parts, I've also done it with just a solar panel, a diode, a supercap, and mcu+radio. That's it. Then the trick is to have your mcu monitor the voltage on the supercap. As the voltage approaches the limit, the MCU turns on the radio receiver to burn off extra current, so that the voltage never exceeds the supercap's limit (usually 2.7v). It works. Having said all that, though, I'm interested in what Gohan will come up with. I'm sure his approach will work too. I'm kind of stuck in finding any ready made product for balancing, so I'm looking at the ALD810026 sab mosfet chip and mount it on a 8soic to dip adapter. It's the closest I could get without the need to print out a pcb. What do you think? I haven't tried to do balancing, so you're guess is probably better than mine. The guy with the swiss accent had a circuit for it. Your solution sounds better than his though because his only worked while charging to maximum charge whereas yours maybe balances after-the-fact and/or to less charges as well? Yes, he used those pcbs from aliexpress that do overvoltage protection, but those are sized for much bigger caps and wouldn't fit much into small boxes. For what I could understand the sab mosfets work while the supercap discharges to keep voltage even across them, so you have to be careful not to apply a higher voltage than the maximum combined of the caps in series. If I could find a way to make a overvoltage protection with some simple components I'd be fine with it. Not long ago someone (was it you?) posted a link to a youtube video where some guy had a charge balancing circuit that wasted very little power, IIRC. He's probably selling it now. Maybe you could just buy one of those? It started charging at around 7:30am: it is placed on an eastern wall in vertical position with practically no direct sunlight. It takes a while to stabilize around 2.55V but overall it looks reasonable for the cost of all the power circuit. What is the cost? Also, it's not clear to me how much usable charge you're getting. Sounds sorta roughly like the kind of circuit used in solar garden lamps, except you've replaced the typical rechargeable battery with a supercap and are boosting to a higher voltage than they typically do. I wonder whether any of them do boost to the same voltage that you're targeting? Perhaps the brighter ones, for example? Those solar garden lights typically have a single, inexpensive integrated circuit that does it all. By "plugged in," do you mean like in your earlier photo? nope, that was the 5.5v supercap version. I mean plugged in in the socket next to the green screw terminal. Of course the buck boost module now it is not used. I have to put the new photo I know. Does it make sense? The output terminals go to the Easy Pcb green screw terminals . I suppose. Why the two diodes again instead of just the one? You'll have a very long charge tail with the diode(s) in that position. Do you mean it will take long time to fully charge? Today was overcast all day so it took about 3 hours longer (until 3pm) to fully charge but overall it looks like a nice graph for the last 3 days. The overcast days are where the two diodes are burning you. Since your goal was "as cheap as possible," what was your final tally on how much it cost? It would be good to know just how cheap is possible. I already wrote it 3 weeks ago. So, something like $4 then I guess at today's exchange rate. .5€ for solar panel, 1.7€ for 100F supercap, 1€ for booster and some cents for MCP1700, diodes and a small PCB. I wonder if you might do better with the cheaper 10F chinese supercaps. Obviously they hold less initially, but the question boils down to whether they end up holding more in the end if only because they're losing charge at a much slower rate. I don't know what the answer will be. It's really an empirical question. I think I found a major flaw in the design: if the supercap voltage drops below 0.8V the booster is not able to work properly and instead of shutting off it starts drawing current until the supercap is empty. I did some startup tests at 0.8V and I saw current up to 140mA, much more than the solar panel can provide. I would need to reach around 1V on the supercap in order to have a safe margin to have a complete startup cycle. At this time of the year the daylight is getting shorter every day and clouds are making even more difficult to get a proper charge. I haven't done many changes so far because I wanted to see how it behaved in the worst conditions that we get during winter. Now the next steps are: adding some code to make sleep time increase as the supercap voltage decreases and making a board with the 3 supercaps I have in order to avoid as much as possible the voltage to drop below the 0.8V. Three supercaps? Sounds like you're leaving the zone of "as cheap as possible." I'd also be leary of a solar design where falling below "x" voltage leaves the system in a state it can't recover from without human intervention. Murphy's Law. Stuff happens. @gohan You can solve that using a voltage detector. 0.2v hysteresis would not be uncommon. So, it would cut the current to your boost converter when the voltage drops below 0.8v, and it wouldn't allow it to come back on again until your supercap voltage reaches 1.0v. @gohan Not really, but the datasheets for voltage detector chips would have example circuits. They're commonly used in brownout detectors and also circuits that do automatic resets if the voltage drops below a particular threshold. Not sure whether Aliexpress has premade circuits you can just buy, which seems to be your preference. Maybe. I haven't looked for that. The design files include a schematic. I believe I found another problem: the discharge I am seeing in the supercaps, I am suspecting it is due to the self discharge as it is not affected by the sleep time and the adding of the second supercapacitor. As usual the Chinese stuff it is just worth the money you pay for it. @gohan What exactly is it that you're noticing? @gohan Maybe before giving up entirely, perhaps you want to try a quality supercap in place of the shoddy one? @gohan do you really need 100F? How much energy does your node consume? Maybe it is easier to get the energy consumption down than to find a cheap huge capacitor wih low self-discharge? Well it probably doesn't need that much, but I plan to add more sensors and I need to compensate for the winter days when it's cloudy and the daylight is shorter. Of course I could expose the solar panel to direct sunlight to optimize the charging but it would be exposed to harsher weather conditions and the sun will cause the temperature reading to be higher. AVX is a good brand. At least worth a shot to test your idea. If it doesn't meet your expectations, then it's not the supercap's fault. If it turns out to be overkill, you can downgrade from there. Or just start with the higheswt capacity AVX supercap that you think is affordable and make your give-up decision after first testing with that. I agree, but I think he just wants to quickly test his proof-of-concept first without thinking about it too hard. Kinda a first-fit rather than best-fit search pattern. We've all done it, I'm sure. Also the buck/boost module has some low voltage issues when voltage drops below 1.4V it start drawing 130/140mA and I needed to increase voltage to 1.7V (where it was drawing 240mA) before it started to supply the correct voltage for the node to boot and have the current back to a normal 20/40mA. I need to find a solution for recovering the node after the booster goes crazy and that would require for sure using a voltage detector like @NeverDie suggested but that is going to require making a custom PCB with integrated booster for the 3.3v output and the supercap charger mentioned earlier. Is anybody willing to help? @gohan that's a pity. Do you know what the root cause could be? Temperature? Charging cycles? Bad part quality? Andreas Spiess did a whole video on how to properly charge supercaps in series. Gohan's supercaps were just soldered together without those protections to get their 5.5v rating. Maybe it was that. Or, since it was outdoors, maybe corrosion got to them.... It would be interesting to hear what Gohan's post-mortem reveals. As Edison would say, Gohan learned a new way of how not to do it. That still leaves a lot of ways that it could be done though. So, maybe that's what happened to the yours that leaked. I couldn't because they are packed together, but it was something I was expecting anyway. I had them completely discharged every now and then when the arduino went crazy and drained them out. I may misunderstand how they work, but I've had the idea that (super)caps are better in short term high current situations. Like regenerative brakes for robot lawnmowers, not slow drain low power devices. It sounds to me like the life boat is the lifepo4 batteries. I'm all for experiments, so please dont stop, but unless the environmental conditions are intolerable for the batteries, I'd say you found your answer.